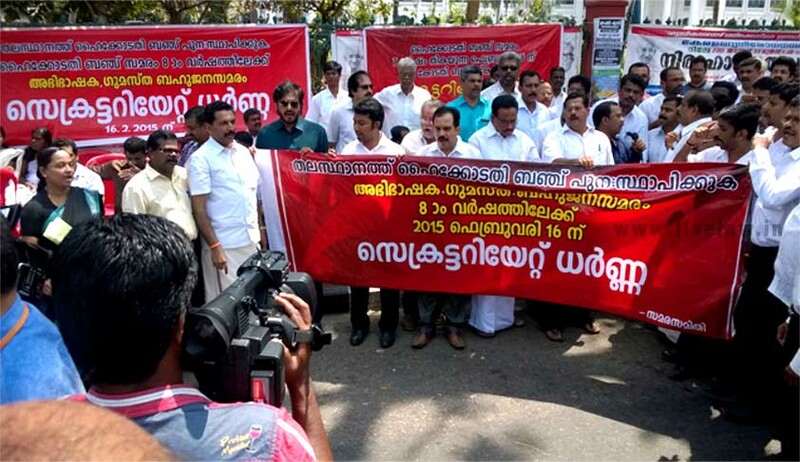 Advocates of Thiruvananthapuram boycotted the local courts today on the completion of 7 years of the second round of agitation for the establishment of a permanent High Court bench at Thiruvananthapuram. The Advocates took out a protest march to the Government Secretariat in the state capital. The agitation was inaugurated by Sri. Pannyan Raveendran, former MP from the Thiruvananthapuram constituency. Sri. Pannyan Raveendran reiterated that the establishment of the High Court bench was essential and the Government can achieve it without permission of the High Court. Sitting MP from Attingal Sri. Sampath and other political leaders were also present and expressed their thoughts at the agitation. Sri. K.P. Jayachandran, President of the Trivandrum Bar Association and Bar Council member said that the meeting of the High Court Bench Action Committee on 19.02.2015 will decide the future course of action and the strike will not be toned down under any circumstances, till the demand is met.